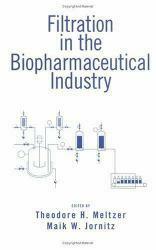 0824798961 - Filtration in the Biopharmaceutical Industry - Meltzer / Meltzer, Meltzer H. / Meltzer, Theodore H.
Excellent Marketplace listings for "Filtration in Biopharmaceutical..." by Meltzer starting as low as $75.44! 9780824798963,0824798961,filtration,biopharmaceutical Marketplace, Marcel Dekker, Inc.
[EAN: 9780824798963], Used, very good, [PU: CRC Press], Ships from the UK. Great condition for a used book! Minimal wear. Meltzer / Meltzer, Meltzer H. / Meltzer, Theodore H.
Offering a comprehensive examination of developments in the field, this book delineates filtration in a host of applications. Addressing quality, security, economic, process development, and regulatory topics, the book covers pre- and sterility grade filters, charge-modified filter media, and aids to filtration, discusses filter quality assurance, pore size, extractables, and compatibilities in various filters, examines filter design and construction, analyzes integrity testing, test sensitivity, and automation, furnishes novel filtration flow methods, explains filter validation, summarizes the U.S. Food and Drug Administration regulations governing filtration, and more.